Harold and Karin Pierce count it a privilege to serve with Armed Forces Baptist Missions. The Pierce family gained experience in military missions as foreign military church planters for thirteen years. During that time, the Lord used them to establish local churches and preach the Gospel outside of military installations. For the last four years with the Lord’s help and guidance, they have been sharing their experience and ministry by helping dozens of missionary families reach our heroes as Deputation Director and National Field Representatives for AFBM. Harold was saved in the summer of 1980 as an eleven-year-old boy. However, he did not become faithful to the Lord until the age of thirteen, when the bus ministry of a Baptist church reached him. After graduating from high school, he joined the Army and served the Lord faithfully in local churches outside of military bases around the world. He served in the Army for six years with a combat tour in Operation Desert Storm. After receiving his honorable discharge, he attended Bible College. God used his service and great love for our military and their families to burden Harold’s heart to the point that there was nothing else the Lord would let him do but surrender to military missions in 1997. While on deputation, he met Karin, the love of his life and they were married. Karin was born and raised in a pastor’s home where her parents lived as Godly examples to their family. 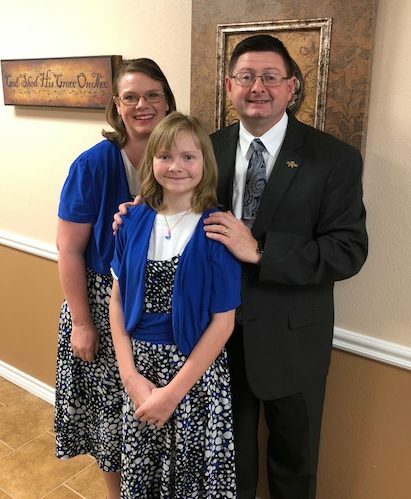 At the age of five, her dad shared with her our Lord’s plan of salvation, and she was saved. She surrendered to the Lord at the age of thirteen for fulltime Christian service. A year after meeting Harold, they were married, following the Lord’s will for our life. While on the mission field, she finished her Bible education with hopes of advancing her ministry to the military. The Lord uses her upbringing and training to make a difference in the lives of our servicewomen, wives of our servicemen, and their children. She is thrilled to cook and love on heroes, missionaries and their families. The Lord blessed the Pierces with their daughter Jenny in 2006. Jenny was saved when she was six years old. She loves playing with the military kids and making them feel at home. God calls AFBM missionaries to serve in unique ways around the globe. Maybe He is calling you to have a special role in Harold and Karin’s ministry. Please pray about partnering with them through prayer and/or financial support. Contact the Pierces for more information and to sign up for prayer letters.